Catfish and the Bottlemen filmed the video for their latest single in South Shields. Indie-rock band Catfish and the Bottlemen have released another video filmed in South Shields. The band, who were formed in Llandudno in 2007, spent time filming around the South Tyneside coast last November. The first fruits from the sessions was the video accompanying the lead single Longshot, which was released in January. A second song, Fluctuate, was released in February, and now they have released a third new track, 2 All, whose video was also filmed in South Shields. The atmospheric black and white footage features the band travelling along a coastal track near Trow Rocks in a vintage Land Rover, before heading along the beach. This still from the Catfish and the Bottlemen video shows then heading along the beach in a Land Rover. They get out at the Amphitheatre in South Shields, and perform the song in one of the covered walkways. As the song comes to a close, drone footage sees them heading back towards Souter Lighthouse, before the video ending with them lounging on sofas around a campfire at Graham's Sands. 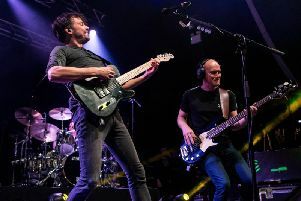 The new video is the latest taste of what's to come from their third album, The Balance, which is due for release on April 26. This still from the Catfish and the Bottlemen video shows them performing in one of the shelters at South Shields Amphitheatre. Catfish and the Bottlemen are Van McCann (vocals, guitars), Johnny Bond (guitar), Benji Blakeway (bass) and Bob Hall (drums). Bond is from Newcastle, which is how they are thought to have gained the inspiration for filming in South Shields. Their last album, 2016's The Ride, gave them their first UK No. 1. Their most recent North East show was at the inaugural This Is Tomorrow festival at Spillers Wharf, Newcastle, last May. This still from the Catfish and the Bottlemen video shows South Shields Amphitheatre. Their next is at Radio 1's Big Weekend in Middlesbrough in May this year. Catfish and the Bottlemen are pictured heading towards Souter Lighthouse at Whitburn in the video.